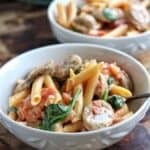 Sausage Penne Pasta | 3 Dinner Recipes Make in 20 Minutes or Less! 3 quick dinner ideas to get tasty meals made in under 20 minutes. 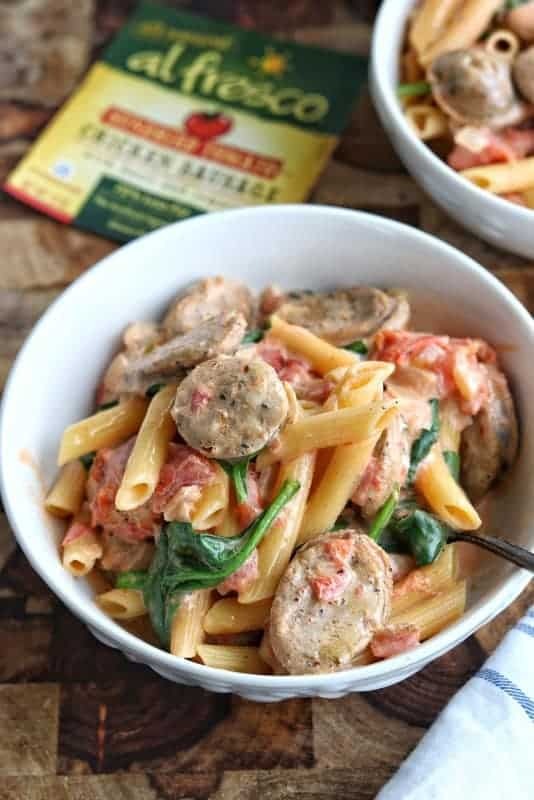 This sausage penne pasta utilizes pre-cooked chicken sausages, pasta, along with fresh and canned veggies to get a balanced meal served in no time at all. Thank you to al fresco All Natural for sponsoring this post. As always, all opinions are my own. These recipes are each a complete meal, ready for your family very quickly. They also make delicious leftovers! 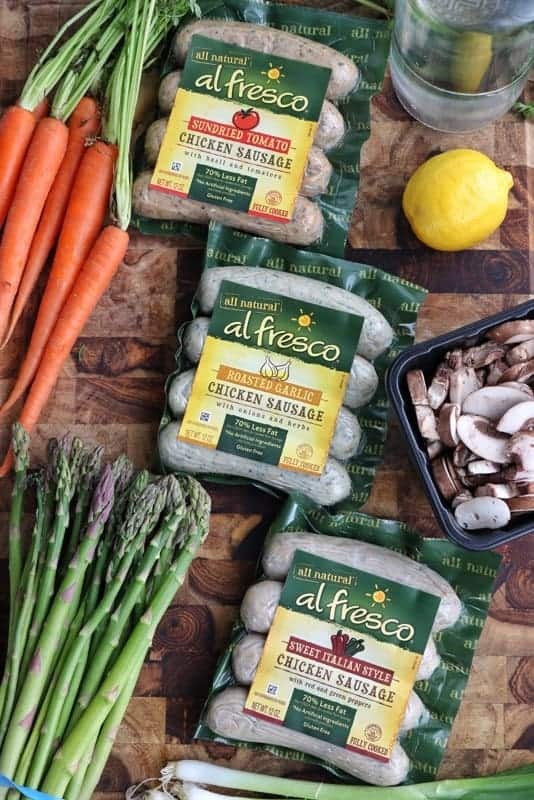 Today’s recipes use three different flavors of al fresco All Natural Chicken Sausage. Cooks Tip: Don’t be afraid to utilize prepackaged options. Check out some of my favorite convenience foods here. This chicken sausage is easy to use. It’s fully cooked, has 70% less fat than regular pork sausage along with 30% less sodium. It’s packed with flavor and can be used in many ways. Sheet pan meals are fantastic for a busy night because everything simply goes onto the sheet pan and into the oven where the whole meal cooks at once. 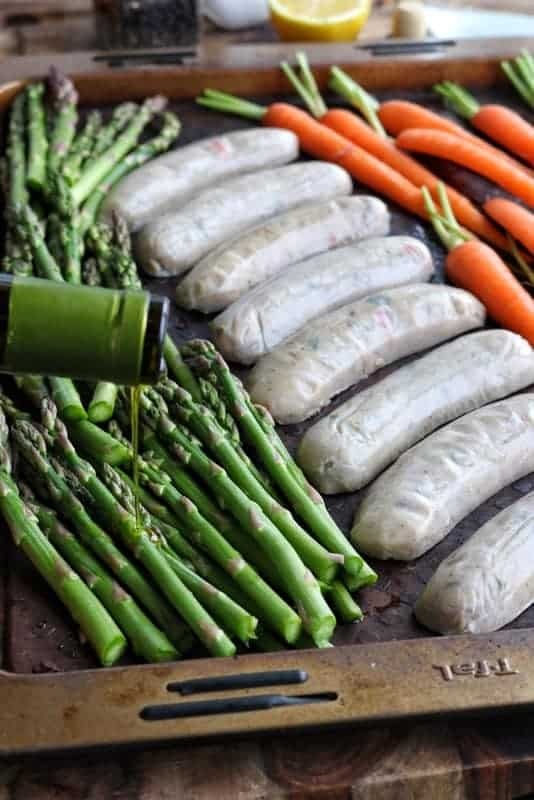 Find the recipe for Chicken Sausage sheet pan dinners here. 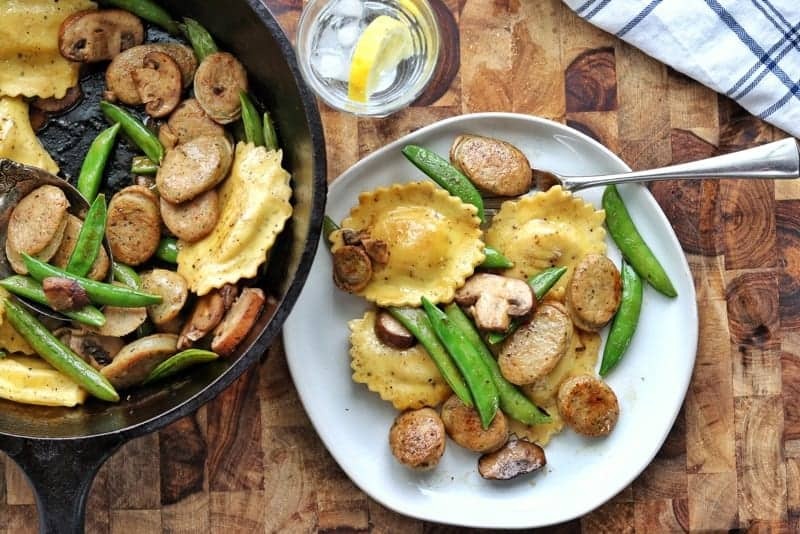 It’s a one-pan dinner idea that comes together in just 15 minutes! 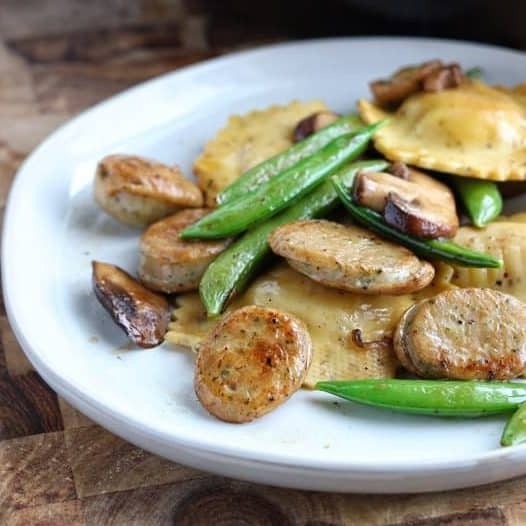 With peapods and mushrooms cooked with the chicken sausage, the veggies are right in the dish. The touch of lemon flavor is so fresh, but you can skip it if lemon is not your thing. Grab the recipe for Chicken Sausage Pasta Here. Who can resist pasta?! This dish has the penne pasta cook right in these sauce, making this recipe a one-pan dinner idea. Who doesn’t love fewer dishes to wash? You can skip the spinach if it’s something your kids wouldn’t eat, but it adds such a pretty pop of color and a great boost of nutrition! If you enjoyed any of these recipes, be sure to leave a star rating below! Share with family or friends who are looking for quick dinner ideas. 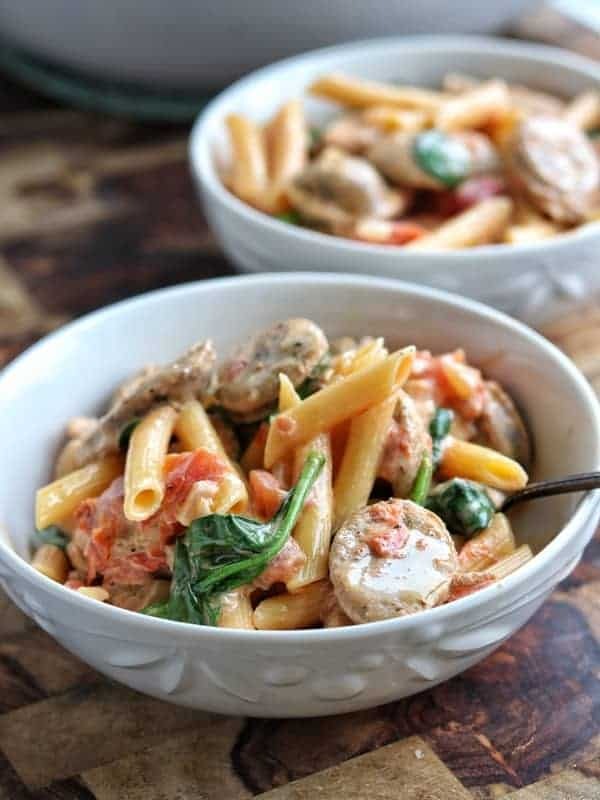 A creamy chicken sausage penne pasta dish loaded with flavor that comes together in under 20 minutes! In a large saucepan, heat olive oil over medium heat. Saute onion until translucent. Add sliced chicken sausage, cooking for 1-2 minutes to brown the sausage. Add diced tomatoes and chicken broth. Adjust heat to bring to a boil. Add penne pasta. Turn heat down and simmer for 7 minutes. Add spinach, salt, and pepper. Stir well and serve! I honestly dont know what I want to eat first since they all look spectacular. I love everyone of these so I guess I will start with that yummy pasta dish! Thanks, Claudia! The penne was a favorite at my house, I hope you enjoy! Now that is one awesome post with three good recipes. Love the simplicity and detail on this post. We love penne in our home and sausage is always a great welcome. Saving this for later. So glad to hear, Veena! I do love simple, it makes life so much easier on busy nights! I love love love this!! Anything that makes the weeknight dinner grind a little easier gets a vote from me. I want to try that sausage penne this week! They all look fabulous and delicious. I am always looking for meals that are easy and fast to make. Not one but three incredible weeknight dinner meals, thank you so much! 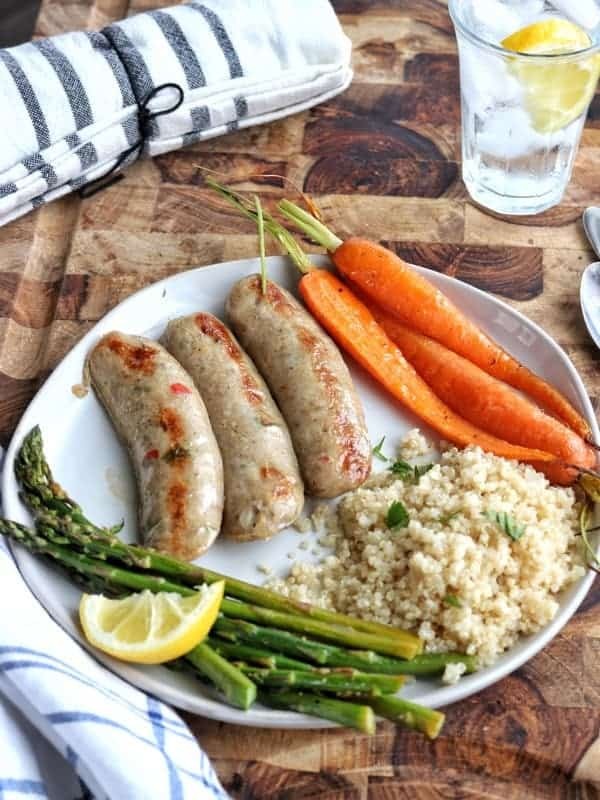 I’ve wanted to try chicken sausage for a while now and was nervous my family wouldn’t like it. But…these look delicious and I’ll be trying one tonight! I find chicken sausage to be so versatile, Tina. My kids (and husband!) love it and I love that I can use it in so many different ways! Gorgeous pics and this recipe is making me drool! 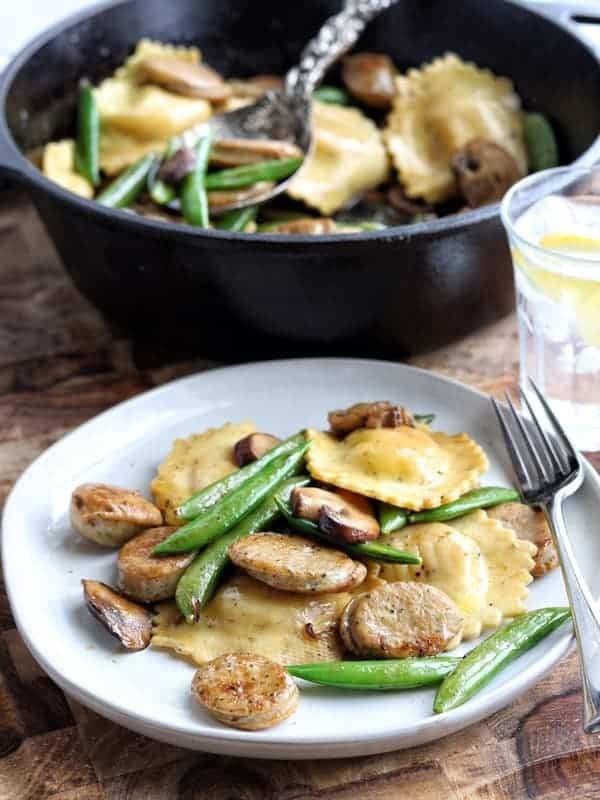 Busy weeknights are always better with an amazing recipe like this! Thanks, Heather! I agree on the busy weeknights. Having a quick plan always helps! You got us in that Title 3 meals under 20 minutes!! All 3 looks fab! And that pasta with chicken sausage must be a clear winner with adults and kids together! Looks fabulous! What great meals!! Sometimes we just don’t have time for complicated recipes but we don’t want to sacrifice taste or nutrition. They all look and sound fantastic. I’m pinning so I don’t lose them. Thanks so much, Marisa! I totally agree. I love cooking, but with small kids it becomes challenging to make complicated dinners. I love finding products that can make life a little bit easier (and tastier too! ).